Happy St. Patrick’s Day! As well as the holiday for celebrating all things Irish, today is the last day in the eleventh week of 2019. As such, it is time for me to publish the next article in our weekly series 52 Code Films. Every week this year, I have agreed to watch one new movie from the American Breen Era. That is, I must watch at least one American film made between 1934 and 1954 which I have never seen before. This series has been a lot of fun for me so far. I have enjoyed discovering new, wonderful movies from the Golden Era of Hollywood and reviewing them here for you. This week, I am going to review another excellent example of the decent, wholesome, and exciting entertainment which was made under the Code. What better way to celebrate St. Patrick’s Day than by studying and praising the clean movies brought to us through the dedicated work of Joseph I. Breen, a true Philadelphian Irishman? 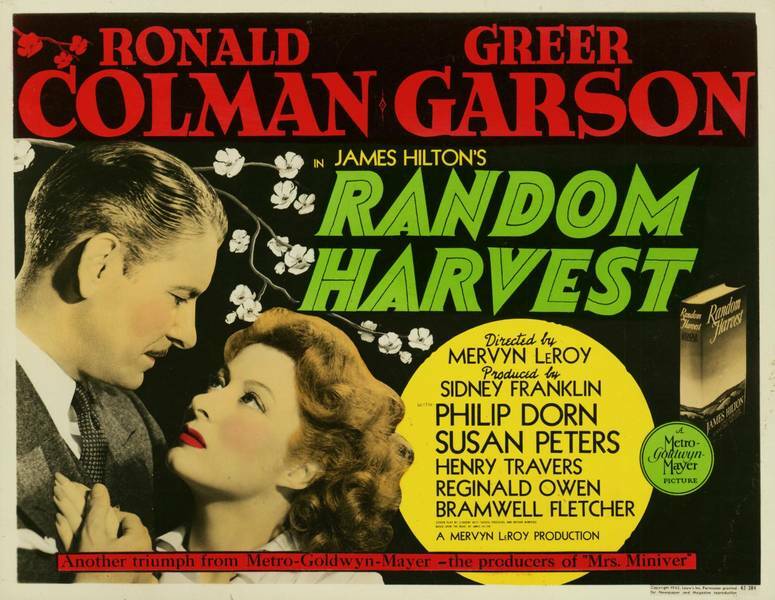 Today’s topic is Random Harvest from 1942. I watched this film this evening. I was busy during the earlier part of the week, so I planned to watch my new movie on Saturday. However, the events of that day made me forget that plan. It wasn’t until this afternoon when my family and I were out and about that I realized I had forgotten to watch a new Code film. Thus, we decided that we would watch a new DVD we have had for a while when we got home. We bought this DVD several weeks ago when browsing the movie section at Barnes and Noble. We were impressed by the cast, the award-nominations, and the story, so we decided to buy it. This last-minute film is my movie for this week. A young World War I veteran is unhappy in a British asylum but so badly shell-shocked that he has trouble speaking and remembers nothing about his past identity, including his name. On Armistice Day, he escapes from the hospital. He explores the town, but he is confused and frightened. While he struggles to communicate with a tobacconist, a kind young dancer advises him to leave the shop, having realized that its owner has identified him as an asylum escapee. She is troubled by the soldier’s condition, so she follows him and engages him on the street. She convinces him to have a drink with her, and they talk. When she hears the amnesiac veteran’s story, she determines to help him. Her friendship and lively personality immediately make his heart lighter and his speech more cohesive. He stays at the hotel where her theatrical troupe is boarding as long as they are playing in town, gaining confidence and enjoying the young lady’s friendship. He is greatly reassured when her boss agrees to employ him so that he can leave with the group when they depart. However, when a guard from the asylum describes the possible violent tendencies of escapees, the boss decides that he can’t take the risk. The young dancer is forced to tell her friend that he has to go back to the hospital for a while, saying that it is best for him. This news, causes him to completely revert to his previous state, unable to even reply. She is horrified to see what the news has done to him, so she quits the show and goes with him to the country to nurse him back to health. Once there, he becomes a new man and starts a writing career. As he becomes a successful author, he is completely happy in his life, despite the fact that he can remember nothing before the hospital. He asks his beloved caregiver to marry him, and she happily agrees. They have a beautiful life together at a country cottage, soon completed by a son. Then, the husband receives an invitation to Liverpool to discuss being a staff writer on a newspaper. His wife is reluctant to see him go, since it is their first time apart since their meeting. However, she just gave birth, so she can’t accompany him, and he must go immediately. Thus, he leaves. In Liverpool, he is knocked down and unconscious by a taxi. When he regains consciousness, he has regained his real identity, but the last thing he remembers is being in a foxhole. He now remembers his name and knows that he is a wealthy industrialist. However, he has no recollection of anything that happened in the past three years. The only link he has to his past is a key, which he doesn’t know is the key to his house. He restarts his life, but he is haunted by questions about the three years he lost. Can he ever reconcile his two identities to find true happiness with his loving wife? The amnesiac veteran is Charles Rainier, known as John Smith, played by Ronald Coleman. 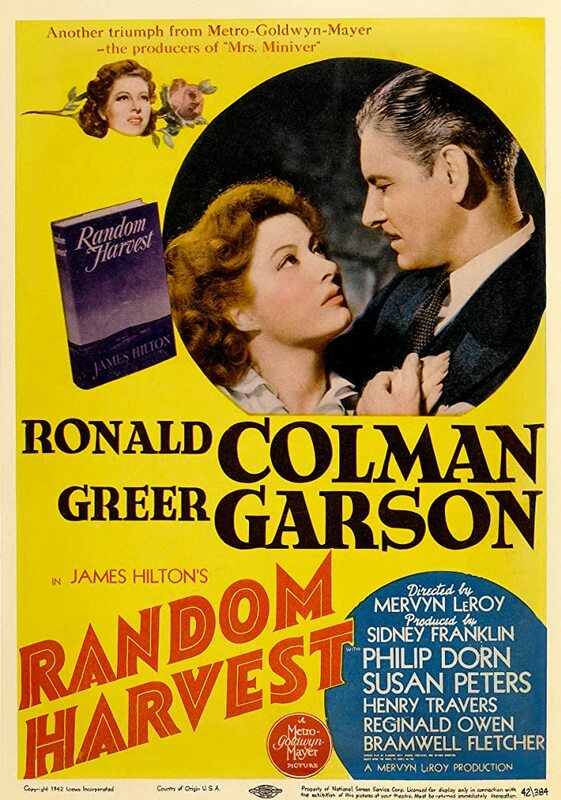 The dancer who befriends him is Paula, played by Greer Garson. The boss of the traveling troupe is Sam, played by Rhys Williams. The tobacconist is nameless, played by Una O’Connor. 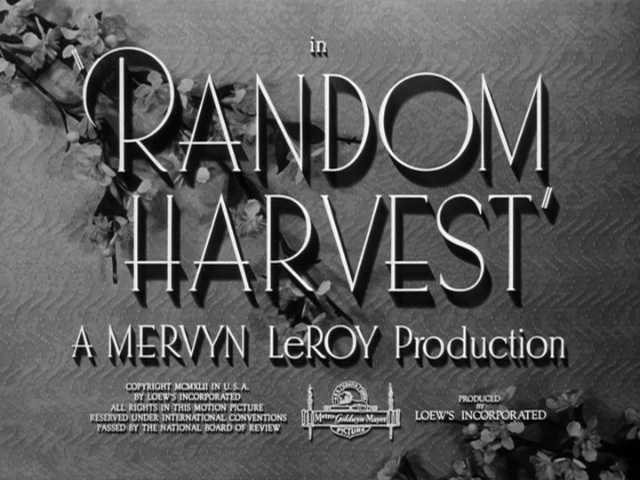 This film was directed by Mervyn LeRoy. It was produced by Sidney Franklin. The production studio was MGM. The screenplay was written by Claudine West, George Froeschel, and Arthur Wimperis, based on the novel of the same name by James Hilton. 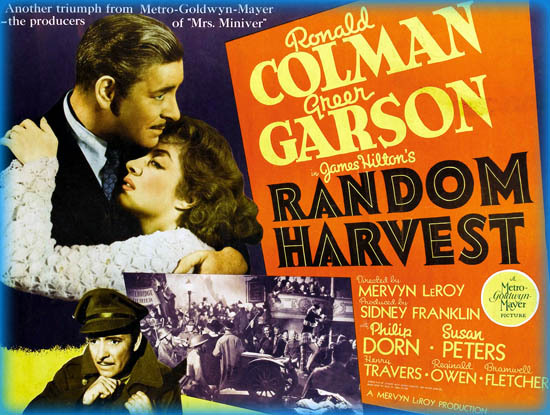 This film was nominated for seven Academy Awards, including Best Picture, Best Director, Best Actor for Ronald Coleman, Best Supporting Actress for Susan Peters, Best Screenplay Writing, Best Black-and-White Art Direction- Interior Decoration for Cedric Gibbons, Randall Duell, Edwin B. Willis, and Jack D. Moore, and Best Scoring of a Dramatic or Comedy Picture for Herbert Stothart. This is a perfect Code film. It is a very deep, dramatic, and emotional picture. It is free from objectionable qualities and Code-violations. In addition, it is very inspiring, moving, and patriotic. Although it is about the British, it is about an Allied soldier during World War I who valiantly fought for his country and lost his identity as a result, a hero with whom a citizen of any country can sympathize.. This heartbreakingly realistic topic was very pertinent in 1942, when both the United Kingdom and the United States were fighting World War II. Audiences on both sides of the Pacific Ocean could relate to this film about readjustment after war, which was a great concern for the loved ones of soldiers overseas. This movie teaches important messages about love, understanding, acceptance, and the patience which we must have while waiting for our disturbed loved ones to recover. Instead of treating him like a lunatic, Paula treats John, whom she calls Smithy, as a well human being, helping him to regain his confidence and assurance. Although this movie is filled with deep emotions, it warms our hearts and inspires us to be more empathetic with those who have suffered and are suffering every day. I think this is a wonderful movie. I really enjoyed it. It effectively showed fifteen years in the span of two hours. The moving story, vibrant script, powerful acting, and beautiful cinematography made it an emotional experience. The characters made me feel their different emotions as they lived through happy and tragic circumstances. I was very impressed by Ronald Coleman’s diverse and multi-faceted performance in this picture. He portrays at least three different characters in this one role. He starts as the shell-shocked, broken John Smith, who is frightened by his own shadow and ashamed of his fractured self-esteem. He doesn’t even know his own identity, but he wants so badly to belong to someone. Later, he is a happy, contented, and vibrant man because of Paula’s loving care. Even though he doesn’t know who he was before, he knows who he is and who what he wants. After he remembers his original identity, he is stoic, reserved, and unemotional. He doesn’t seem to really be living his life. He is stuck in business which he doesn’t like and haunted by a time he believes may have contained real happiness for him. Ronald Coleman seems like two or maybe even three different men in this film. He so effectively changes characters that it is no wonder he was nominated for Best Actor for his performance. 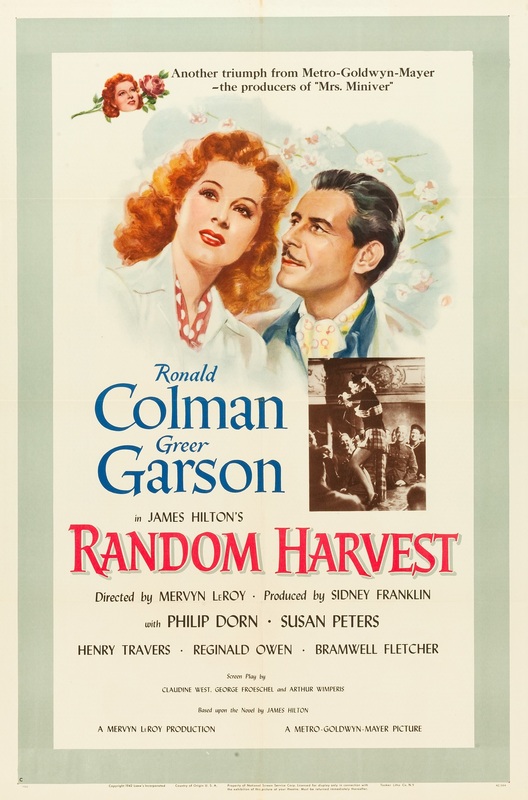 Greer Garson is just as good in her role as the steadfast woman whose love never changes throughout the years. Her beloved’s mental state never makes her waver. Even when he doesn’t recognize her, she is true and devoted to him. The rest of the cast is excellent as well. Herbert Stothart’s score beautifully complements the movie. This is truly an exquisite film. I highly recommend this film to my viewers. I cannot praise it enough. I truly believe that it is a flawless example of a perfect film from the Code Era. It personifies everything a PCA-approved film was, is, and should be. In terms of moral acceptability for people of different ages and sensitivity, even the Classification and Rating Administration would have to agree that this is completely acceptable for general audiences. There is nothing in religious or racial categories to offend anyone. This movie is squeaky clean from any viewpoint except perhaps that of the Kaiser. However, this movie does not fit in the classifications which often are associated with G-ratings and a lack of offensive elements. It is not a children’s film, it is not light subject matter, and it is not composed of immature material. It is truly a family film, but it is not just for families. It is for children, elders, young adults, middle-aged people, and adolescents. It is for married couples as well as for single people, friends, and families. It is for devoted classic film fans, people who enjoy movies from many eras, and those who have never seen old films. It is for men and women. It is for those who like war films, drama-lovers, fans of romances, people who enjoy historical stories, and all other movie fans. This movie is intense and heart-wrenching at times, but it is a masterpiece of Code cinema which, I believe, will be loved by everyone who sees it.